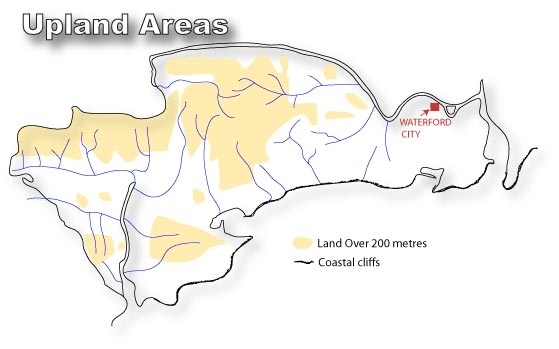 There are three mountain ranges in County Waterford. The Knockmealdown mountains, divided by one of the most beautiful mountain passes in the country, lie in the north-west of the county, on the border with Tipperary which holds the main part of the range. The Comeragh and Monavullagh mountains, or the Comeraghs as both ranges are collectively known, form a large isolated massif in the heart of Waterford surrounded by rich agricultural land. Although Old Red Sandstone is the predominant rock formation in these mountain ranges, the topography is strikingly different. The flat, almost featureless central plateau of the Comeraghs is ringed by several superb corries, due almost entirely to ice-action or glaciation. By contrast, the Knockmealdowns consist of an impressive row of peaks surrounded by extensive heather moorland with few deep glens or corries. During the Glacial Period, ice and snow was slow to melt in some mountain ranges, particularly on north- and east-facing slopes, and these glaciers, in slipping slowly down the mountain sides, gouged out rocks and boulders, resulting in precipices at the valley tops and often along the sides with deep basins below. The material scooped out was deposited across the valley lower down and the ice and water residue was retained, forming the spectacular corries found in the Comeraghs. There are no less than 16 corrie lakes in the Comeragh range and one in the Knockmealdowns; all occur at around 400 metres in the coums backed by lofty cliffs. The higher reaches of the Waterford mountain ranges are to be visited more for their scenery than for their birdlife. The mountain tops, whether the Comeragh plateau or the Knockmealdown ridges, can be bleak, windswept places, even in summer, and are frequently enveloped in mist. It is possible to walk for hours and see very little apart from Meadow Pipit, Skylark and very rarely Red Grouse. Occasionally, a Raven, an early breeder in the Comeraghs, will call and tumble overhead. Once in a while a rarity will appear and there are odd records of Snow Bunting in the Comeraghs in winter. No doubt occasional Dotterel pass through, autumn vagrants from Scottish and northern European breeding grounds (with several records from the 19th century). In early summer, flocks of fast-flying Swifts skim the peat hags of the Comeragh plateau and in late summer, groups of Rooks often leave the lowlands to feed around the mountain slopes. In the autumn, small parties of Golden Plover occasionally appear over the tops, probably on passage to the Waterford wetlands lower down. The mountain slopes are more productive in terms of birds, the more so as one descends. Boulder-strewn grassy slopes are haunts of Wheatears in summer. Where the Heather Calluna vulgaris is dense and bushy, the diminutive Wren will be seen, or more usually heard, throughout both ranges. Stonechats breed on the more vegetated slopes, but always in small numbers. Choughs have been recorded mainly around Coum Mahon and Coumshingaun (Comeragh mountains) in summer, probably wandering non-breeding birds. Scree slopes with plenty of plant cover nearby are habitats used by Ring Ouzels, present in both the Knockmealdowns and the Comeraghs, though these birds are rarely seen. A good supply of young Heather is required by Red Grouse; in the Comeraghs the best areas are the Knockanaffrin and Monavullagh ridges, and they are best found at dawn or dusk in the breeding season when their noisy call will usually reveal their presence. The northern end of the Comeraghs, in the Nire valley, and the east and west ends of the Knockmealdowns are flat and boggy, a habitat that suits breeding Curlew and Snipe. By contrast, the high inaccessible corrie cliffs of the Comeraghs provide secure, spectacular and mostly undisturbed nesting sites for Peregrine Falcons and Ravens. Kestrels are occasionally seen hovering in search of small prey on the slopes of both ranges, and some pairs breed in the forests in old nests of Hooded Crows. Occasionally, a Merlin will breed in one of these stick nests at the forest edge but these are rare birds in the Waterford mountains. The habitat in the Knockmealdown range is somewhat more suitable for this elusive and fast-flying raptor, but there are annual records from the Comeraghs. Hen Harriers prefer young forestry plantations for breeding and the few early spring records from both ranges suggest that birds are prospecting for breeding sites. However, few if any pairs remain to breed in the Comeraghs, though small numbers remain in the Knockmealdowns. For most of the year, the soil in both ranges is waterlogged, which, over the centuries, has resulted in extensive blanket bog formation on the mountain plateaus and gentle slopes above 200 metres. The high annual rainfall and humidity in these upland areas combined with peat formation, leaching and infertile soils ensures that the corrie lakes are deficient in nutrients. Biologically, the upland lakes in Waterford are unproductive so that birds are few and none are very permanent. Grey Herons and Cormorants can often be seen, usually singly, and occasionally small flocks of gulls will roost on the lakes. There are one or two breeding records of Mallard near the Comeragh lakes but these are exceptional. Slightly more common at lake edges and in the fast-flowing streams rushing down the valleys is the Irish Dipper, often seen bobbing up and down on mid-stream rocks. Because of the acidic nature of the water, aquatic larvae and nymphs are scarce, so consequently, Dipper territories are large and the species is nowhere numerous. Similarly, Grey Wagtails will often be seen in the streams lower down the valleys, probably more numerous than the Dipper, but are rare at high altitude. Below 300 metres, Bracken Pteridium aquilinum grows profusely with Hawthorn Crataegus monogyna and the occasional Rowan tree Sorbus aucuparia scattered along the hillside. These isolated Rowan trees are often occupied by breeding Hooded Crows. Further down, Holly Ilex aquifolium appears and Gorse Ulex europaeus is extensive. The foot of the mountain is the best place for birds as it has sufficient vegetation to provide food and shelter from the harsh mountain weather. It is a zone relatively untouched by modern agricultural practices, apart from the grazing of sheep, and at the lower altitudes Cuckoos may be found. Nightjars are also possible in the forest clearings at the edge of the Waterford mountains, but, being nocturnal, they can be particularly hard to find and are seldom seen. Redpolls, Siskins, Long-eared Owls, Woodcock and many other species will be present in the forests and clearings at the lower altitudes in both Knockmealdowns and Comeraghs, though many of these, concealed in the tree canopy, will be hard to detect. Sika deer are also likely in some forestry plantations. For the botanist, St. Patrick’s Cabbage Saxifraga spathularis grows profusely in both ranges, particularly at the higher altitudes and the Mossy Saxifrage S. hypnoides is also found. With some searching Marsh Hawksbeard Crepis paludosa and the Welsh Poppy Mecanopsis cambrica will be located, and the Irish Spurge Euphorbia hyberna occurs in the Nire Valley. Less wanted perhaps is the expanding bank of Rhododendrons R. ponticum around Bay Lough in the Knockmealdowns. Many of the Waterford coums support an excellent heath vegetation with a rich bryophyte flora, characteristic of upland areas with high annual precipitation. Lichens are particularly abundant, with the Cladonia species most conspicuous, and some rarities like Menegazzia terebrata and Mycoblastus sanguinarius have been recorded in the Comeraghs.